One issue with global warming is discerning how much of that warming is human caused. Global temperature data is only available since 1850. That might contain biases within the data, some recognized (like the urban heat island effect) and others maybe less so. Going further back is notoriously difficult, with proxies for temperature having to be used. Given that (a) recent warming in the Arctic has been significantly greater than warming at other latitudes (see here) and (b) the prominence given a few years ago to the impact of melting ice sheets, the retreat of Arctic glaciers ought to be a useful proxy. I was reminded of this with yesterday’s Microsoft screensaver of Johns Hopkins Glacier and inlet in Glacier Bay National Park, Alaska. By 1879, when John Muir arrived here, he noticed that the huge glacier had retreated and the bay was now clogged with multiple smaller glaciers. I did a quick search on how for more information on this retreat. At the National Park Service website, there are four images of the estimated glacier extent. The glacier advanced from 1680 to 1750, retreated dramatically in the next 130 years to 1880, and then retreated less dramatically in the last 130+ years. This does not fit the picture of unprecedented global warming since 1950. The National Park Service has more detail on the glacial history of the area, with four maps of the estimated glacial extent. The glacial advance after 1680 enveloped a village of some early peoples. This is so something new to me. Previous estimates of glacier movement in Glacier Bay have only been of the retreat. For instance this map from a 2012 WUWT article shows the approximate retreat extents, not the earlier advance. Is this recently discovered information. I have marked up the John Hopkins Glacier where the current front is about 50 miles from the glacier extent in 1750. The National Park Service has a more detailed map of Glacier Bay, with more detailed estimated positions of the glacier terminus at various dates. From this map the greatest measured retreat of John Hopkins Glacier was in 1929. By 1966 it had expanded over a mile and the current terminus in slightly in front of the 1966 terminus. This is an exception to the other glaciers in Glacier Bay which are still retreating, but at a slower rate than in the nineteenth century. As the human-caused warming is supposed to have predominately after 1950 the glacial advance and retreat patterns of the extensive Glacier Bay area do not appear to conform to those signals. 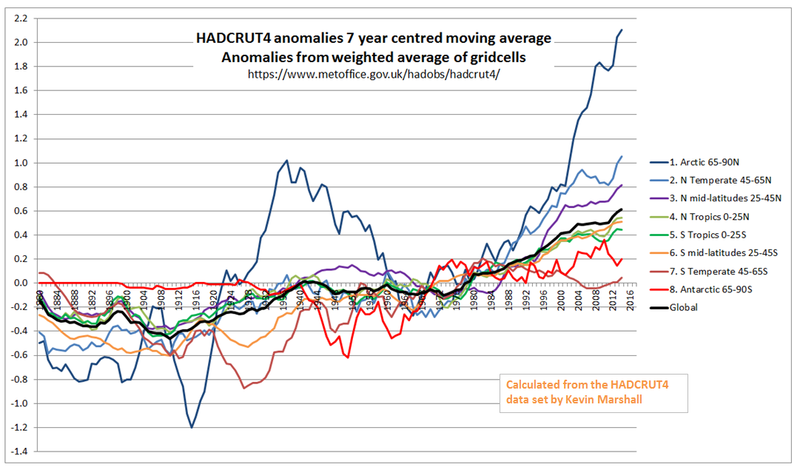 A cross check is from the Berkeley Earth temperature anomaly for Anchorage. Whilst it might explain minor glacial advances from the 1929 to 1966, it does not explain the more significant glacial retreat in the nineteenth century, nor the lack of significant glacial retreat from the 1970s.